Both pickling and passivation are chemical processes that are utilized to provide protection to metals against corrosion and pitting. In either process, an acidic solution is applied to the metal surface to remove contaminants and to aid in the formation of a continuous, chromium-oxide passive film. Without pickling and/or passivation, stainless steel is subject to corrosion in service which can lead to costly quality issues. Although pickling and passivation both involve using acids to treat the surface of metals, there are some very distinct differences between the two processes. When steel is heated by welding or other means to the extent that a heat tint or oxide scale layer is visible, the layer below that has been depleted of chromium, thereby making the steel less resistant to corrosion. Pickling steel is the process of applying an acid solution to remove heat affected zones along with the underlying chromium reduced layer from the stainless steel. Pickled steel is free from surface carbon steel contamination and embedded iron particles. It typically leaves a dull, matte gray finish. 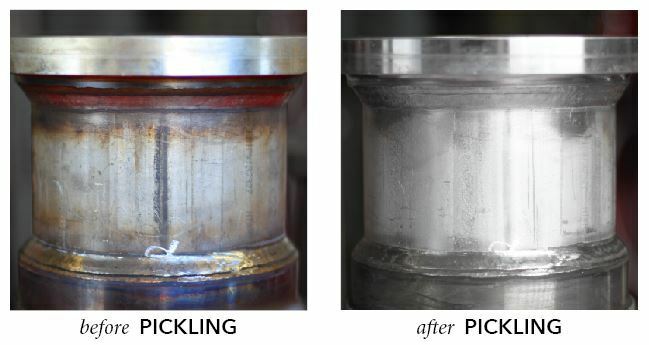 Simply stated, pickling removes the heat affected layer of stainless steel and prepares the surface for passivation. Passivation is a process that is separate from pickling, which can be performed on its own or after pickling. Unlike pickling, the passivation process does not remove any metal. Instead, the surface of the stainless steel is treated with an oxidizing acid, to dissolve carbon steel, sulfide inclusions and remove iron and other surface contaminants from the stainless. The acid further works to promote the formation of the chromium-rich passive film, which imparts the corrosion resistance quality. Whereas pickled steel will appear dull or etched, passivation that is done correctly does not affect the metal’s appearance. What are the Benefits of Pickling and Passivation? Tank Immersion – Usually done at an Astro Pak site and is advantageous for treating all the fabrication surfaces at the same time for uniformity of finish and optimum corrosion resistance. Circulation – Chemical solution is circulated through a system of pipework and is particularly recommended for piping that will carry corrosive liquids. Spray Application – Can be done at Astro Pak or at a customer site and advantageous for on-site treatment but proper acid disposal and safety procedures are essential. Gel Application – Manual treatment can be accomplished by brushing on pastes or gels to the surface. It is useful for spot treatment of welds and other intricate areas that require manual detail. The cleaning solution is rinsed from the surface and the pickling process treatment is applied by one of the methods mentioned above. Process control is essential as corrosion and pitting can occur if the acid concentration is too high and/or if the acid contact time is too long. After the process is completed, it is imperative to ensure that all residual acids are removed and neutralized to prevent pitting and corrosion. For optimum corrosion resistance, proceed with passivation process. Astro Pak has been performing Pickling and Passivation for nearly 60 years. We pickle steel and other metallic surfaces to remove corrosion and weld damage from steam, heat and other corrosive environments. Our pickling steel process is a non-selective surface treatment that removes oxidation from stainless steel on heavily corroded surfaces. It is also used for nickel or super-austenitic. In addition to our expertise in circulating chemistry through facility equipment, tanks, and distribution systems, we also have a proprietary UltraPass® Gel Pickling & Passivation process to address surface discoloration, spot rouge, heat affected zones (HAZ) of welds, or corrosion on most exterior surfaces. Astro Pak delivers chemical cleaning and passivation services to installed systems: pre-operational, pre-commissioning of new construction, post-modification, or for maintenance during shut-downs. Whether it is UltraPass®, nitric acid, or other chemistries, we can process piping, fittings, vessels or other types of equipment. We can perform our on-site at your facility or in one of our state-of-the-art nationwide facilities. Astro Pak’s fleet of vehicles, mobile skids, and equipment allow us to come on-site to respond to emergency situations for critical utilities, systems and equipment. Wtih the completion of each job, you receive cGMP compliant documentation packages for your systems and equipment maintenance records.